One of most critical elements for an addiction treatment program to manage effectively is the percentage of patients who successfully complete treatment. 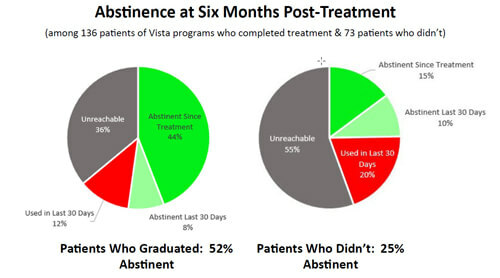 As our research team analyzed treatment completion data for Vista’s first Outcomes Summit last week, we were surprised by the wide range of treatment completion rates among our clients. Among short-term residential treatment programs using INSIGHT Addiction™, for example, the percentage of patients who successfully completed all recommended treatment ranged between 43% and 97% at different programs. We also saw substantial variability in treatment completion rates for programs providing long-term residential or IOP treatment as well as those providing a full continuum of care. You can download an overview of the TEDS-D treatment completion norms for different types of addiction treatment here. 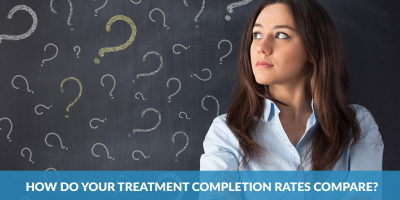 Armed with this data, we highly recommend you compare your treatment completion rates with the national average for your type(s) of treatment. 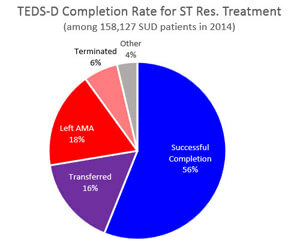 Why does the percentage of patients who successfully complete treatment matter so much? Because research shows that patients who successfully complete treatment are far more likely to remain abstinent after treatment than those who don’t. Because of this strong correlation between successful treatment completion and post-treatment abstinence, it is clear that one of the most important ways a treatment center can improve its outcomes is to focus on reducing the number of patients who leave treatment against medical advice (AMA). Like most things, of course, this is only true up to a point – you don’t want to allow trouble-makers who aren’t serious about treatment to poison the recovery environment of your facility. Vista’s next Outcomes Summit will be in November 2018. If you are potentially interested in attending this by-invitation-only event to brainstorm with other addiction treatment thought leaders about how to improve treatment results, please let us know. Do You Have the Data You Need to Prove How Effective Your Treatment Is? Pay-For-Performance is Coming. Are You Ready?